Armadale residence is the result of a cohesive and collaborative design process with a like-minded creative. The home is that of Penelope Cohen – Creative Director of fashion label Skin and Threads. Penny engaged Simone to rework her formal living room and ensure that this grand old dame of a Victorian, had a contemporary and feminine sensibility with a fashionable edge. 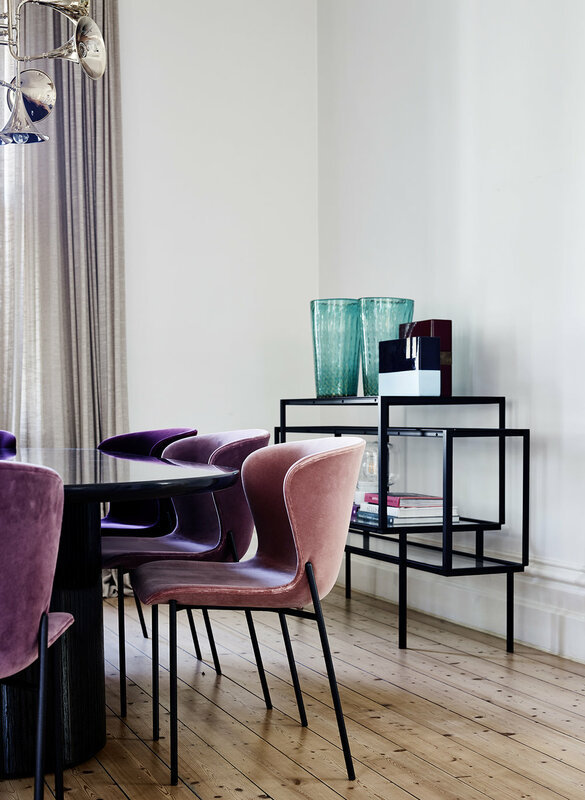 Knowing her client wasn’t shy of colour or texture – Simone incorporated plums, navys and mustards into the space. The dining chairs all differ slightly in tone and tie back to the Colin Penock painting. Elements of vintage were sourced (such as the Italian 50’s chairs, the bar cart and the Danish vintage lamp). Simone overlaid the space with ceramics and objects and of course worked in the client’s library of incredible fashion books.